Roseanne Barr, American comedian, in her studio in Los Angeles, USA. Please credit: Sarah Lee/Guardian News & Media Ltd 2008. I was not one of the 18 million who tuned in to see Roseanne. A significant number of viewers were in Chicago. That didn’t surprise me. We have one of the most segregated cities in these United States. To be honest I didn’t watch Roseanne when it was on television before. Before you think I am just a snob let me be clear. I love Shameless, another story about struggling poor people in an urban environment. Shameless is set in Chicago. William Macy plays what might seriously be called a “deplorable”. He has a history as a lousy parent, most often found drunken and drugged on whatever “high” is available. He’s also brilliant which makes his wasted life even more disturbing. The actor’s life is in drastic opposition to his character on Shameless. He’s a self proclaimed everyman, WASP who campaigned for John Kerry. As the father of the troubled Gallagher family Macy is acting and doing it successfully. Barr has had a tough life dotted with mental health issues, a child put up for adoption, accusations against her parents for abuse, multiple marriages, some questionable reports of possibly going blind that have sense been reduced to an operable condition. Her return to the small screen is playing herself and that doesn’t require acting. She is a self professed Trumpster known for racial slurs about Muslims and others. She openly has bought into the conspiracy theory that Sandy Hook deaths was a hoax. Roseanne is a deplorable. Her performance is simply playing herself. CNN reported today, In today's America, where activism is on the rise -- Black Lives Matter, immigrant rights, protests against gun violence -- ABC shouldn't be surprised if it sees a boycott of the show, targeting advertisers to take a stand on Barr. Trump and ABC executives may not care about Barr's past views, but I'll bet advertisers will. That leads me to an idea. Maybe we should ask ABC to sell the Roseanne show to FOX? I went through the list of FOX television shows. Here it is. If ABC wants more for giving up the Roseanne Show maybe they can trade for Master Chef, Master Chef jr., Hell’s Kitchen, So You Think You Can Dance and maybe Orville and X-Files. Admittedly these are the only shows I watch or possibly might watch. While we’re at it why not ask FOX to pick up the now cancelled Duck Dynasty. So instead of asking the advertisers to pull funding from a show, we can ask Comcast and other internet providers to allow us, the patrons, to have FOX FREE CABLE. That would really put a crimp in FOX channel revenue and the ultra FAKE FOX NEWS while getting rid of Roseanne. I never watched Roseanne I, because like many sit-coms, they are boring and.. not funny. I didn't watch Roseanne II debut, either. I won't ever watch it. If you give Roseanne time the show will morph into one that will be attacking Trump and "deplorables". Why? Because those who cannot tolerate any difference of opinion will go after their advertisers. That's the new activism in America today. Opposing points of view are NOT allowed and you will submit. Give Roseanne the person some credit, too. She can't stand VP Pence. That should count for something, no? At least a run of six shows before advertisers are attacked by the intolerant, I am guessing. No, probably not. One more night of good ratings for Roseanne and the will be enough for a boycott to be announced. Richard, I suspect you are correct about the blow back from opposition via boycotts and sponsor companies bailing out. We want freedom of speech. We want a society accepting of differences. Most of us don't want a hate embroiled country. 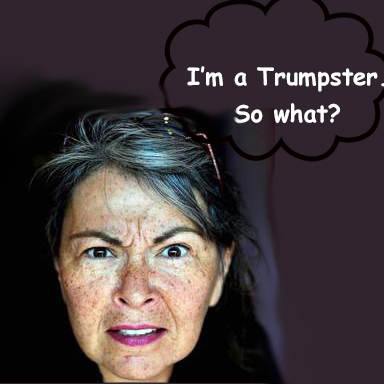 Roseanne Barr has a right to her opinion as does the character she portrays. Where we draw the line gets more difficult everyday. I personally, like you, won't watch the show. I don't find much to laugh about in supporting Trump in any form.